In the last few days our Moon has eclipsed Mercury, Venus, the Sun, and Saturn in order. Writing in the Pacific Northwest of the United States of America, I am looking through a window upon the Japanese Maple in my front yard releasing its flaming red astral leaves in the wind. A stormy gale is blowing through the tall trees and evergreens in view, with intermittent showers of rain descending upon the soaring crows, broken up at times by a white cloud break of sky blue. Similar to a reflective response to today’s tumultuous weather, there is not much more we can do to prepare for eclipse season than to center in our being within the field of chaos and change. While we are still in range of eclipse aftershocks, the eclipses of this season are now finished until the next equinox (there will be a solar eclipse on March 20, 2015). If we can create a sacred or womb like sphere of contemplation, insight is beckoning discovery. Although this recent solar eclipse was partial and not full, the fact that Venus was also involved in the eclipse in the same period of the superior conjunction of Venus with the Sun, with Mercury simultaneously stationing direct in the sign of Venus, means that the ripples of this time will have far reaching effect. The superior conjunction of Venus and the Sun happens when Venus is moving direct, on the other side of the Sun from our home planet, uniting in the same degree of the zodiac as the Sun and beginning a new cycle that will lead to Venus arising nightly as an evening star. In the thirty or so days before and after this moment, Venus disappears from our view in the sky under the rays of the Sun, and so the superior conjunction is a sort of wintery solstice moment in the sense of promising a return of her light. Archetypal and mythic astrologers are especially prone to link the cycle of Venus with underworld goddess myths such as the story of Inanna and Ishtar, and Her descent to the underworld to face Ereshkigal, the Great Goddess in the land under the earth, the land of the dead. From this perspective the superior conjunction of Venus is a pivotal moment of soul searching and regeneration in her cycle. However, I feel a key to tune into is Mercury, our winged angel at the threshold, our soul guide in between boundaries of the upper and underworld, as Mercury from our perspective on Earth is as still as it ever gets, stationing to move forward again. If you remember, Mercury originally stationed retrograde conjunct the point of the Solar Eclipse and the superior conjunction of Venus on October 4, 2014. Now, it has completed its retrograde and stationed direct conjunct the North Node of the Moon, and opposite Uranus and the South Node of the Moon. Corresponding with Dane Rudhyar’s description of Mercury as the weaver of patterns of relationship, commingling meaning out of commerce with the multitude of information sources accessible to our perception, we have a unique moment now to cut through our awareness of past patterns of relationship in order to weave together new patterns of relationship connected with our future, ever changing sense of self. Mercury stationing direct is not always interpreted as being the most “razor sharp” moment of thought and consciousness, yet I feel that has to do with your perspective on consciousness. Mercury stationing direct is similar in my mind to waking consciousness, when we emerge from our dream world into an awakened world, yet we are still connected to our time in dreams and we may have moments of not knowing what is dream and what is waking. At this time we are beyond the duality, we are both at once, and each is all of our awareness. Yet far from fogginess, we may receive a startling comprehension as described by William Blake: “Knowledge is not by deduction but Immediate by Perception or Sense at once . . . Forms must be apprehended by Sense or the Eye of Imagination.” The more we open to this sense of Blake’s that “Man is All Imagination,” the more Mercurial knowledge into our deep nature will be revealed in line with Blake’s understanding that “The Imagination is not a State: it is the Human Existence itself” (Damrosch, p. 14 – 16). In general, eclipses are said to be negative, but this is a misunderstanding of the shadow function. In both solar and lunar eclipses, the light of either the Sun or Moon is obstructed from reaching the Earth. When the light of consciousness is temporarily blocked, something else is revealed- that which is normally hidden. Called windows into secret realms and open doorways into the subconscious, eclipses allow us to access that which has been concealed or repressed in our lives. Eclipses are said to be karmic in nature, because they relate to issues that lie outside of our consciousness. If we are out of touch with this hidden material which Carl Jung calls “the shadow,” then we may judge it as bad and destructive. We are shocked because this material seems to come out of nowhere, when in fact it was with us all along. To the extent that we have tried to repress the shadow material, we will call the results of the eclipse disastrous. But to the extent that we are open to the unconscious and the surfacing of hidden problems, we will experience the emergence of this material as neutral, revelatory or healing. Dane Rudhyar said that at the New Moon solar eclipse, the present is blotted out by the past, while at the Full Moon lunar eclipse, the past is obscured by the present. This statement suggests that at a solar eclipse, the Sun- which represent our consciousness awareness- when obscured, allows the forces of the past which lie buried in the unconscious as psychic complexes, to be seen, confronted, and experienced with the possibility of integrating these previously unconscious energies into the present awareness. During a lunar eclipse, it is the past, symbolized by the Moon, which is obscured and can be released. In the absence of the conditioning of the past, the possibility emerges of meeting experiences in a new manner. Of further importance is the fact that the Sun in these last two eclipses was conjunct the North Node of the Moon in Libra, suggesting forward drive through the chaos toward our desire, and a stirring up of new ways to approach future-oriented growth. Mars also ruled both eclipses, from the perspective that the Moon was in Aries in the lunar eclipse and the Sun and Moon were in Scorpio during the solar eclipse: another sign of desire compelling our will forward. Since the lunar eclipse was in the cardinal sign of Aries and conjunct Uranus, it may have had more of an immediate impact on our perception through a dislodging of past patterns to be released. 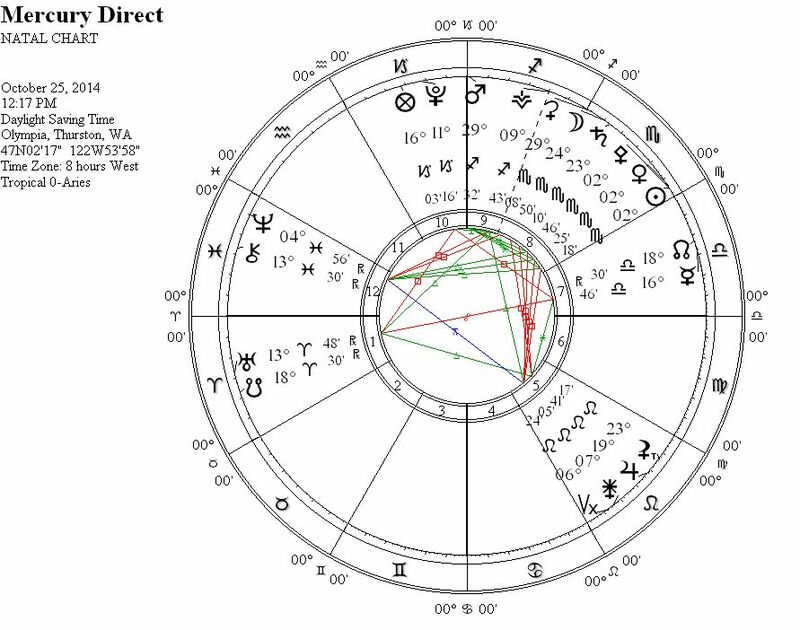 In contrast, the partial solar eclipse occurring at the very beginning of the fixed sign of Scorpio may not have made such an instantaneous effect in your life, unless the beginning degrees of Scorpio make significant aspects in your natal chart. However, the deep, fixed nature of Scorpio, as well as the additional power of Venus and Mercury in association, means that the solar eclipse could have sweeping, extended, and drawn out repercussions. Again, Mercury is an important focus as it has stationed direct more tightly conjunct the North Node of the Moon than the solar eclipse, closely opposite Uranus and the South Node of the Moon in Aries. Fascinatingly, the Moon eclipsed Saturn in Scorpio at the same time Mercury stationed direct, symbolically opening the gates of Saturn to the Uranian, transpersonal vision of the outer planetary bodies. Many astrologers believe that Uranus is a higher octave to Mercury, and in this moment of Mercury stationing direct opposite Uranus, there can be no argument that Mercury in Libra is actively receptive to Uranus and weaving new patterns of inter-relationship that go beyond our usual conditioning of culture and Saturnine boundaries. Mercury can be our guide, but Mercury can also serve us and other components of astrology like Jupiter- the consciousness we apply to Mercury, the way we look through Mercury at our world matters. If we are wrapped up in fear now, we may weave together new ways to be afraid; if we are overcome by greed and motivation for greater status, we may weave together new ways of manipulating other people to serve our own benefit. Moreover, since Pluto in Capricorn is also in square to Mercury in Libra, meaning that there is a t-square between Pluto in Capricorn, Uranus with the South Node of the Moon in Aries, and Mercury with the North Node of the Moon in Libra, the full effect of all of this on us can be cathartic and shattering. The more we claim this moment to go deeper into our nature if we have already been soul searching, or choose to engage in a new pattern that is more about our Self than our fears or compensation for our insecurity like greed, the more we will participate in the active change serving the higher good that is possible in the collective now. Unfortunately, since many people are not doing this hard work of Self, these same astrology aspects going forward could correspond with continued and increasing warfare, violence, and oppression in our collective consciousness. Venus was also part of the Scorpio solar eclipse, though not part of the visual phenomenon as she was on the other side of the Sun from the Moon and already invisible. However, since Venus recently was conjunct the North Node of the Moon in Libra as well as Mercury retrograde in Libra, Venus beginning a new cycle through the heart of the Sun holds a new relationship we can have with our future development that at the same time involves confronting our past patterns of relating. We may be reminded of a past relationship behavior, we may be triggered by something that has more to do with an old relation than our present heart and mind, but in any case these associations with our previous values and ways of relating are here to reveal to us that we can release what has held us back in the past: we are not stuck or incapable of change and evolution. 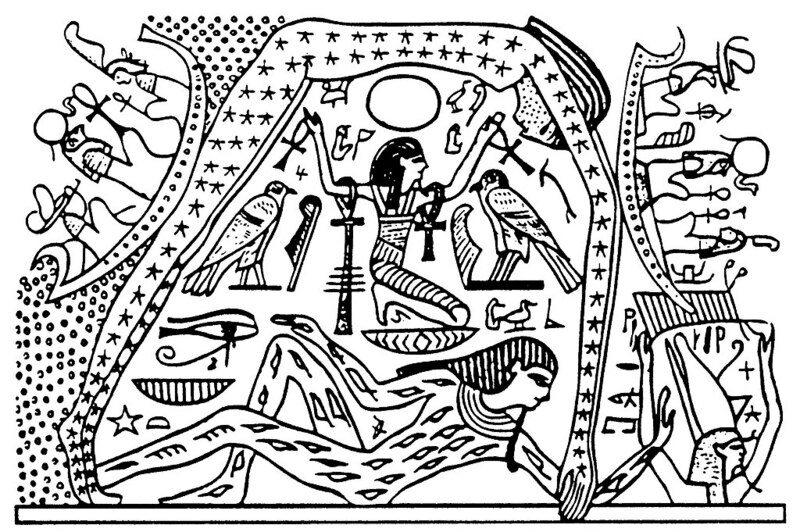 As previously mentioned, the Venus superior conjunction at the beginning of Scorpio is also a strong link to the underworld goddess myths and tests of diverse cultures, bringing a sense of the heroine’s journey and the need to answer the call. Yet Venus is known to be in detriment in Scorpio traditionally in astrology, and Venus being eclipsed by the Moon in Scorpio shortly before her superior conjunction has an added dimension that the Moon is considered to be in its fall in Scorpio. Piercing through these labels, the lessons we may find here revolve around our deepest, core, unconscious feelings and values, emotions that may feel unsettling to unearth from our psyche. Give yourself at least a month of focused intent to burn off the past issues or karma that no longer serve you. In thirty days or so, at the end of November, Venus will arise again with her brilliant white light, illuminating our evening sky momentarily at first, staying with us longer in the evening hours each successive day. From the perspective of declination in astrology, what is even more amazing about the end of November will be that at the time Venus arises again as an evening star, she will be united with Mars in declination, barely within the bounds of the Tropic of Capricorn. In this same period Venus in Sagittarius will be in a Grand Fire Trine with Jupiter in Leo and Uranus in Aries, more closely in trine with Uranus. On an archetypal level, this could be a time of integration between masculine and feminine energies within, our receptive magnetism and active energy, the Jungian concepts of the animus and the anima. It also makes me think of the Axiom of Maria concept from alchemy that Carl Jung took into his concept of individuation, that out of the One (unconscious wholeness) comes Two (conflict of opposites), Two becomes Three (transcendent resolution), and the Third becomes the One as the Fourth (transformed, whole consciousness). This process represents the idea of all the unconscious energy that has become stimulated now eventually leading us into a more fully realized individual consciousness: just remember it is a process that takes time. In case you do not understand the concept of declination illustrated flatly above, in declination we pay attention to the location of celestial objects within the relationship between the Earth’s equator and the ecliptic, the apparent motion of the Sun on our celestial sphere. 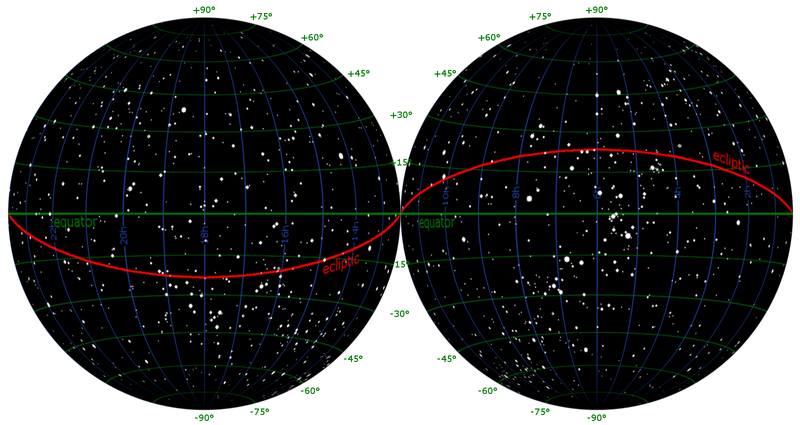 The high and low points shown in the red ecliptic line on the above graphic are important, as they are the Tropic of Cancer to the north and the Tropic of Capricorn to the south. The Tropic of Cancer is 23º26′ north of the equator, and the place of the Sun at the Summer Solstice in the Northern Hemisphere that occurs in June. Similarly, the Tropic of Capricorn is 23º26′ south of the equator, and the place of the Sun at the Summer Solstice in the Souther Hemisphere that occurs in December. Using Mars as an example, if Mars goes further than 23°26′ north or south of the equator it would mean that Mars is “out of bounds” or in extreme declination. This gives a wild, maverick, independent streak to whatever celestial object is out of bounds, essentially meaning that the associated archetype is going to be its own ruler, think for itself, and go after what it wants. Since the beginning of October 2014, Mars has been in extreme declination, meaning that the wild bounding nature of the centaur associated with Mars being in Sagittarius has been even more intense, further adding a wild personal will into the Grand Fire Trine that happened between Mars in Sagittarius, Jupiter in Leo, and Uranus in Aries. Mars reached its peak extreme in declination at about the same time as the solar eclipse in Scorpio, and current events in North America revealed the shadow side of the aggressive red planet out of bounds: the shooting at Parliament Hill in Ottawa, another attempt to jump the fence at the White House in Washington D.C. (this one taken down by security dogs), and a horrific shooting at a high school in Marysville, Washington that ended in suicide. Yet the other side to this out of bounds Mars is an out-of-the-box sense of will, power, and desire that is essentially out-of-this-galaxy, as Mars at the end of Sagittarius has been conjunct our Galactic Center. In combination with Mercury stationing direct opposite Uranus and conjunct the North Node of the Moon, this could be difficult chaos or liberating illumination depending upon how you respond or in what environment you enter. Some individuals will experience this as a sense of meaninglessness and emptiness, and will manifest a diffuse or undefined personal identity or purpose . . . The key is to let go of the past and to allow new patterns, ideas and impulses to enter the consciousness of their own accord. Approached in this way, these new thoughts, ideas, and impulses become the light that illuminates the path to the individual’s future. Continuing the amazing 2014 theme of Mars and Venus, when Mars conjuncts Pluto in Capricorn on November 10, Venus will be approaching a conjunction with Saturn in Scorpio. From now until then, coming out of the insights gained from the eclipses and Mercury stationing, become as clear as possible about the future life you want to live and do the hard inner work to clear whatever obstacles are getting in your way of pursuing your desired life. As Neptune in Pisces will also be stationing direct in mid November, it could be a great time to set a powerful intention for a new beginning. He whose desire turns away from outer things, reaches the place of the soul. If he does not find the soul, the horror of emptiness will overcome him, and fear will drive him with a whip lashing time and again in a desperate endeavor and a blind desire for the hollow things of the world. He becomes a fool through his endless desire, and forgets the way of his soul, never to find her again. He will run after all things, and will seize hold of them, but he will not find his soul, since he would find her only in himself. Truly his soul lies in things and men, but the blind one seizes things and men, yet not his soul in things and men. He has no knowledge of his soul. How could he tell her apart from things and men? He could find his soul in desire itself, but not in the objects of desire. If he possessed his desire, and his desire did not possess him, he would lay a hand on his soul, since his desire is the image and expression of his soul. Damrosch, Leopold. (1980). Symbol and Truth in Blake’s Myth. Princeton University Press. George, Demetra. (1994). Finding Our Way Through the Dark. AFA. Green, Jeff. (2009). Pluto Volume II: The Soul’s Evolution through Relationships. Wessex. Jung, Carl. (2009). The Red Book: Liber Novus. Edited by Sonu Shamdasani. Norton. I love reading your posts about astrology using Jung’s ideas and symbolism. I wish I understood more of astrology, enough anyway to speak the language. This passage from Jung also strongly resonates with me. There is perhaps a kind of Judo necessary to embrace desire and not see it as the enemy, but also to have awareness of its power and beauty. In this sense desire and love are close companions and perhaps must never be too far apart. I’m so thrilled to have discovered your blog and so enjoy spending time here contemplating ideas, new to me, about influences of an astrological nature. I am delighted you are enjoying my writing through astrology- astrology is a lot to wrap the mind around at first, but the more you stay with it, the more it will come to you. I was also integrating some more complicated astrology topics into this post than simply discussing the meaning of certain signs and basic transits, so I imagine it would be hard to understand if unfamiliar. I have entertained ideas in my mind of creating some webinars to teach some astrology, so I will make sure to let you know if I do so, if you are interested. Regarding desire- Yes. The webinars would be great. Yes, I would be interested. Reblogged this on The Muse. Thank you again for sharing my work. Beautifully written in every way. The Axiom of Maria is worth studying thoroughly and it may take a lifetime to understand it. I realized recently that alchemical procedures do not rise from lower to higher but they are endlessly repeated in a spiral-like fashion: “One becomes two, two becomes three, and out of the third comes the one as the fourth,” and then it starts all over again. The golden thread is woven and unwoven endlessly. Solve et coagula (‘separate and join together,’ an alchemical motto which suggests analyzing a substance into its components before synthesizing the desirable elements into a new substance), but never stop and always be ready to dissolve what you get yet again. Like in individuation, from the state of undifferentiated wholeness we are supposed to strive for unity, but once we achieve it, we must never sever the golden-thread connection with the whole. Thank you for returning with your Beauty again here- there is powerful imagery in the painting and words you have shared. I know I am only barely beginning to comprehend alchemy as it relates to individuation, and I can see how one could spend vast amounts of time studying it. For example, it has been said that Newton spent more time on it than his “more scientific” pursuits. 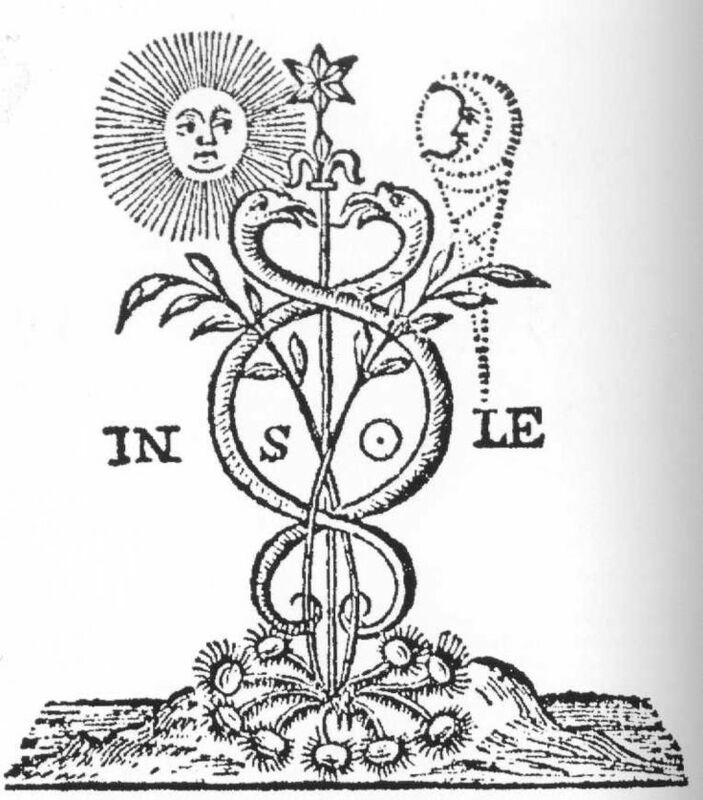 When I saw Robert Bosnak lecture on alchemy through the Jung Platform, he mentioned that the text in old alchemical texts he and others were studying (he was a student of James Hillman) was incomprehensible, and they had to work and work at it, holding it . . . and then something would happen that changes you. It sounds to me like this magical idea that as you work with the words of alchemy you work with alchemy itself and undergo your own alchemical process potentially. It’s fascinating to me that you were writing about Nigredo at the same time I was looking at a few of the associated ideas. I was trying to find more information on the Internet about Nigredo and alchemy in relation to Jung, and found a quote in which he connected Mercurius with the world-creating-spirit concealed in matter, the beginning and the end, a symbol uniting all opposites, like the Ouroboros, the prima materia, the dragon, and the nigredo. In this way I see your idea about the spiral- I see time as a spiral, and feel the spiral is a prima materia symbol for me that is at the essence of existence. The importance of Mercurius for alchemists cannot be stressed enough, of course. And the way they understood Mercurius is so fascinating. Lachman goes on to link this idea to the work of physicist David Bohm and “the strange ability of elementary particles to communicate apparently with each other instantaneously, regardless of the distance separating them, and to somehow know each other’s position, speed and other factors (which, in a mechanical, Newtonian universe is impossible), Bohm posited what he called the ‘implicate order.’ [in the lecture by Robert Hand I recently transcribed, he cited this same observation as one of his main supports for non-localized underlying soul stuff] For Bohm this meant the separateness of our spatial-temporal world, which he calls the ‘explicate order’ is really an illusion, created by our senses. Beneath this explicate order is a deeper underlying reality, the implicate order, which is spaceless, timeless and, like Swedenborg’s infinite, unified, possessing what Bohm calls ‘unbroken wholeness’ . . . . .
Okay- are you still reading this? If so I have an additional reference to Mercury, by way of traditional astrologer Alan White, who in an interview with Chris Brennan critiquing the use of Uranus in modern astrology, talked about the significance of Uranus being discovered at 26 degrees of Gemini. He said there is a traditional association by Vettius Valens of Mercury with chaos, and conditions that show up with no explanation. Thank you- I am assuming Carol T using the name nettle love is the Carol T dear to my heart. I am thrilled I have been able to return a small portion of the inspiration to you that I have received from you and your work for years. Your work is so inspiring, Gray! Thank you!